Manufacturers, distributors, and retailers can be liable for injury and death resulting from the use of such dangerous products. Liability is usually based on one of three things - a design defect, a manufacturing defect, or a failure to warn. A design defect occurs with the design of the product is not safe. The engineer or designer failed to design a product that, if manufactured properly, would be safe for the user of the product. A manufacturing defect occurs when a product might have a safe design, but due to faulty or poor manufacturing or quality control processes, the product is dangerous. Finally, a manufacturer might be liable for failing to warn a consumer about the proper use of a product. A manufacturer has a duty to provide to a consumer proper instructions in a product's use. A specialized area of personal injury trial law involves products that are unreasonable dangerous by the nature that they are designed, manufactured or marketed and cause injury to a consumer or bystander. This is a complex area of litigation that requires an attorney capable of building a technical case against corporations well equipped to avoid their legal responsibility. Products can range from pharmaceuticals to automobiles. All manufacturers owe a duty to make their products reasonably safe especially if any defect is not one easily recognizable by the consumer. If you or a loved one has been seriously injured or killed by a dangerous or defective product, it's important to seek the advice of an experienced defective product attorney right away. Evidence should be gathered as soon as possible after the accident, including photographs, measurements and other documentation, as well as the product itself, which will need to be preserved throughout the legal proceedings. Jimmy C. Bailey is prepared to bring forty successful years of ability, expertise and resources to represent each injured client as a result of damages and injuries suffered and lost – including medical bills for treatment of injuries, lost income, disability, disfigurement, loss of enjoyment of life from pain and suffering and loss of daily activities. 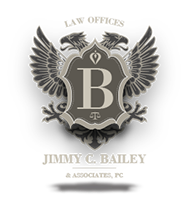 At Jimmy C. Bailey & Associates, we treat each client and their case with skilled, compassionate understanding. We provide a background of aggressive success depending on each individual’s injury and allowed damages.